Mouthguards help prevent dental emergencies! The American Dental Association and the Academy for Sports Dentistry recommend a professionally-made, properly-fitted custom mouthguard for all contact and collision sports. According to the American Dental Association (ADA), more than 200,000 oral injuries are prevented each year by wearing a mouthguard. Over 5 million teeth are knocked out each year, and the lifetime cost to replace one tooth is approximately $20,000. Mouthguards can also vastly reduce the degree of force transmitted from a trauma impact point (jaw) to the central nervous system (base of the brain). 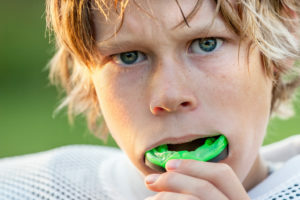 Custom sports mouthguards are designed to match the exact structure of each player’s individual mouth, and they will last longer and be more comfortable than boil-and-bite guards. Custom sports mouthguards are designed for optimal oxygen flow. The better the fit, the better the players’ performance. Players get the comfort and protection they need while still being able to communicate clearly with teammates. A custom sports mouthguard with a player’s team colors or favorite colors quickly becomes a favorite piece of their uniform.